Click here to view some examples of Workshops presented. The themes can be used as a guidance, but can be customized according to your needs. Custom Workshops: Various options apply in terms of custom designed workshops. Workshops are presented to groups of 20 people. 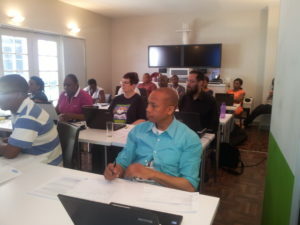 The workshop can be hosted at the In the Cloud computer training venue in Rietfontein, Pretoria, South Africa, or at a venue convenient for the participants. Should you be part of a wider region, you are most welcome to organise an event with 20 people, and we will come and do the training. High quality Internet access is a requirement, as well as laptops/desktops, and the required facilities to present a workshop. Please email info@inthecloud.org.za for a quotation.